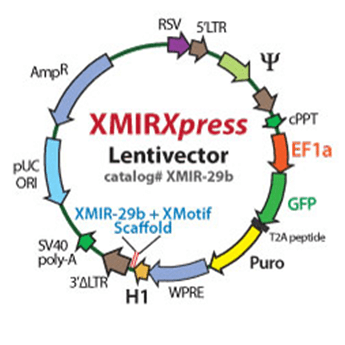 A control XMIRXpress Lentivector that encodes a non-targeting miRNA. Use SBI’s XMIRXpress Lentivector with a Non-targeting miRNA as a control for your exosome-packaged miRNA studies. Like all the XMIRXpress Lentivectors, this construct uses the XMotif to package a small RNA into exosomes, but the small RNA is non-targeting.